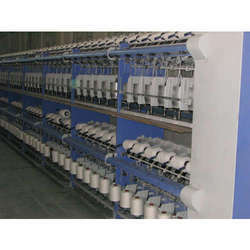 Leading Manufacturer of tfo twister double decker machine, two for one yarn twisting machine, two for one twisting machine and spun yarn tfo twister machine from Surat. 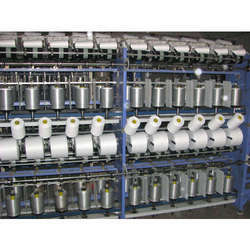 We offer TFO Twister For Spun Yarn Double Deck. Drive Motor pulley is being driving directly with nylon sandwich flat belts offers Highest power Transmission efficiency and starting and stopping of machine without twist faults ( Tangential drive). Live display TPI, Yarn speed in MPM & Spindle speed in RPM. TFO Twister takes up less space thanks to double deck, reduced spindle gauge & machine width is narrowest. Lowests Spindle height is adopted to greatly reduce the balloon size & low energy consumption. Sturdy frame structure of sheet metals provide vibration free smooth running at higher spindle speed. 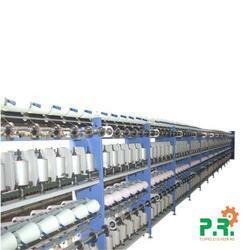 Spindle with aluminium anodized pot with long lasting low abrasive surface gives gentle touch to yarn. Extremely low CV% because of drum apron, cradle pressure & belt pressure pulleys. Auto cradle lifting arrangements prevents damages to the wound yarn surface, & keep the original quality of package thoroughly. Auto cradle lifting attachment helps to increase productivity. Cradle pressure is designed to decrease in proportion to increase in the package dia, & weight results uniform density of package. Internationally accepted adjustable capsule type tensioner. Pre take-up cover provided for safety of operator. Take up package up to 2.5 kgs. helps to increase productivity. Traverse gearbox with pattern breaking device offered uniform density & unwinding of package. Maximum life of Traverse gearbox & twist change gearbox with help of oil circulating system (oil-bath). Rail Guided operating trolley provide for easy operation of machine. Live display of TPI, Yarn speed in MPM & Spindle speed in RPM. Take up package Take up package up to 2.5 kgs. Live display TPI, Yarn speed in MPM, & Spindle speed in RPM. Live display of TPI, Yarn speed in MPM, & Spindle speed in RPM. 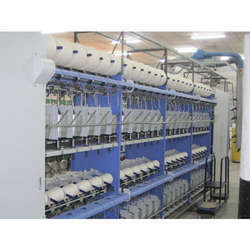 TFO Twister for Spun Yarn offered comprises sheet metal frame structure with powder coating finish.These come with drive motor pulley which is driven directly with nylon sandwich flat belts, thus offering highest power transmission options. Further, these also feature quality spindles, ceramic guides and cradle lifting attachment.